This post is a little unusual in the realm of what I usually post, but I've been looking forward to writing it and hearing what you think! Before I started blogging, I would always see bloggers post about LIKEtoKNOW.it, and I was, admittedly, completely disinterested. The name sounded confusing to me, I didn't realize it was an app or know what it did, and I was pretty resistant to downloading/learning anything new. I imagine that some of you are in this category- if you have ever even heard of the LIKEtoKNOW.it app at all- so I thought I would just do a quick overview of what the app is, why I love it as both a consumer and a blogger, and how you can use it if you're interested! LIKEtoKNOW.it is a downloadable app that allows you to instantly shop looks from your favorite influencers in a lot of categories (home decor, outfits/fashion, beauty, etc.). You can also access these looks through most influencer's websites or their instagrams via links in their bios (which typically link back to their LIKEtoKNOW.it), but believe me when I tell you that doing it directly through the app is SO much easier and more fun! I will even say that when it comes to using an app just for fun, LTK is my FAVORITE app to browse and play on! I even prefer it now to instagram or facebook (gasp!) because I have always had a fondness for browsing online shops when I'm bored or want something mindless. Here's how it works: When an influencer posts a picture in the app, she will find links to that EXACT product and link them on the app, and the app will tell you how much the item is before you even have to click on it. If you do click on the item, it will take you directly to that product on the specific retailer's website, and you can get a closer look and purchase if you love it! The app basically answers the question "Where did you get that?" and makes it super easy for you to look up the details on your favorite looks whenever you please! 1. 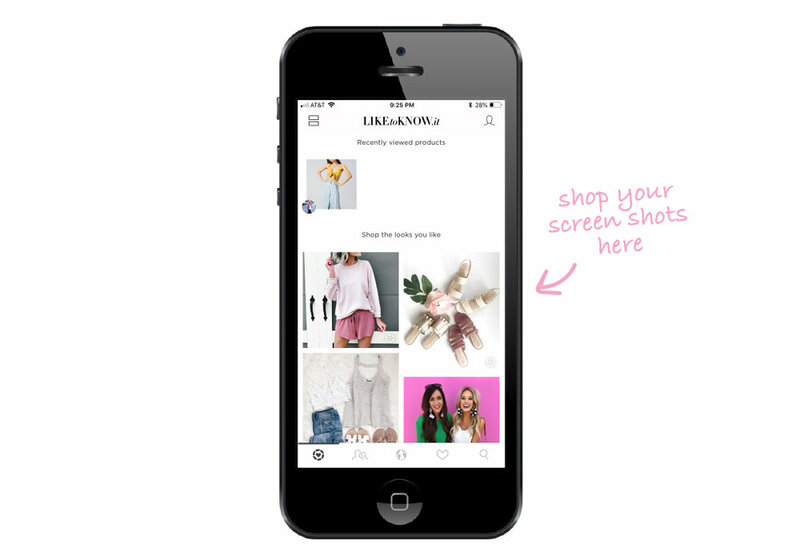 Screenshots: The app allows you to screenshot a picture you like on instagram, pinterest, facebook, or another social channel and then receive an email with shoppable links to everything in the photo. When you set up your profile in the app, you can choose how often you'd like to receive the emails (if at all). Your screenshots will also be on the first page of the LTK app when you open it so you can find the stuff you really loved very easily! 2. My Feed: This is the second icon in the app, and this houses all of the influencers that you follow in the LTK app. This is the page I spend the most time on in the app! When you find an influencer whose style you really love on instagram (or another social channel), you can type their instagram name into the search bar on the far right and follow them so that you always see their shoppable posts in the app! 3. Discover Page: Much like instagram, the LTK app has it's own discover page that will show you influencers you may not have heard of with a similar style/aesthetic to those you already follow. You can also discover by hashtag at the top of this page which is really helpful if you are looking for a good sale or a specific price range. It's like browsing the online sale section of all of your favorite stores at once! 4. My Wish List: This is a newer feature of the app, but one that I'm really loving! When you click each item in the app, there will be a small heart next to the item. If you like something but aren't ready to make a purchase on it yet, you can favorite it by clicking the heart and add it to your wish list! Those items stay put for as long as you want them to. I love going back to look at what I loved a few times a month and seeing if anything is now on sale! This feature is also super helpful when it comes to developing Christmas lists or gift ideas. Influencers love the LIKEtoKNOW.it app for more than one reason- not only as consumers, but as businesspeople. I have found that there are a lot of people who don't know that bloggers do have an opportunity to make money from the things that they post. LIKEtoKNOW.it was created by a company called rewardStyle who provides influencers with affiliate links to *almost* every brand imagineable. Those affiliate links mean that if someone makes a purchase directly from a link we posted (either in the app, on our website, in direct message, from our instastories swipe up, in our instagram bio, etc. ), we receive a commission from that brand for the item purchased. There are no mark-ups on the links bloggers use to account for the commissions or anything like that, it is exactly the same for the consumer- it is simply a brand's way of compensating the influencer for advertising their product. It also provides an income source for bloggers who are spending a lot of time, energy, and money to create content. If you want to support your favorite bloggers and make sure they can continue to create the content you enjoy, the LTK app is one of the most reliable ways to ensure they receive their commissions for the items you purchase from them. For instance, if you utilize a swipe up on instastories and are interested in an item a blogger shows, then get out of instagram and go to that store's website (even if you're still on your phone) to search for and purchase the item, the blogger would not receive commission for that purchase since it was not through her link. If you are making a purchase directly from a link you clicked on in the LTK app, you are guaranteed to provide the influencer with her commission for that purchase. Clear as mud? Haha- Feel free to reach out to me if you want more of an explanation on that! My answer to this question should not be a surprise by this point- haha. However, I do want to iterate that I am not only telling you about the app to ensure that I receive commissions if you purchase from me through the app (although ALL bloggers do very much appreciate it when you all utilize our links + it gives us the income/motivation to continue on this wild adventure ;)), but I truly do enjoy the app as a consumer as well. I have told countless friends/family about the app too, and they all had the same reaction to it that I did! It is so much fun to browse through the app as a new way to online shop. It's even more fun than browsing a store's site because you can see all of the items on a REAL person's body- not just a model or stock image- and get some inspiration for how to style the items as well! CLICK HERE to download the LIKEtoKNOW.it app for yourself and CLICK HERE to follow me in the app so you never miss a post! Thanks for reading friends! I would love to hear your thoughts on the LTK app or if you think you'll give it a try!